The Salon de Paris, beginning in 1725 was the official art exhibition of the Académie des Beaux-Arts in Paris, France. Between 1748–1890 it was the greatest annual or biannual art event in the Western world. From 1881 onward, it has been organized by the Société des Artistes Français. In 1673, the royally sanctioned French institution of art patronage, the Académie royale de peinture et de sculpture (a division of the Académie des beaux-arts), held its first semi-public art exhibit at the Salon Carré. The Salon's original focus was the display of the work of recent graduates of the École des Beaux-Arts, which was created by Cardinal Mazarin, chief minister of France, in 1648. Thereafter, the Salon influenced French high culture. Exhibition at the Salon de Paris was essential for any artist to achieve success in France for at least the next 200 years. Exhibition in the Salon marked a sign of royal favor. In 1725 the Salon was held in the Palace of the Louvre, when it became known as Salon or Salon de Paris. In 1737, the exhibitions became public and were held, at first, annually, and then biannually in odd number years. They would start on the feast day of St. Louis (August 25) and run for some weeks. Once made regular and public, the Salon's status was "never seriously in doubt" (Crow, 1987). In 1748 a jury was introduced. Its members were awarded artists. From this time Salon got its undisputed influence. The Salon exhibited paintings floor-to-ceiling and on every available inch of space. The jostling of artwork became the subject of many other paintings, including Pietro Antonio Martini's Salon of 1785. Printed catalogues of the Salons are primary documents for art historians. Critical descriptions of the exhibitions published in the gazettes marks the beginning of the modern occupation of art critic. The French revolution opened the exhibition to foreign artists. In the 19th century the idea of a public Salon extended to an annual government-sponsored juried exhibition of new painting and sculpture, held in large commercial halls, to which the ticket-bearing public was invited. The vernissage (varnishing) of opening night was a grand social occasion, and a crush that gave subject matter to newspaper caricaturists like Honoré Daumier. Charles Baudelaire and others wrote reviews of the Salons. The 1848 revolution liberalised the Salon. The amount of refused works was greatly reduced. In 1849 medals were introduced. Le salon étouffe et corrompt le sentiment du grand, du beau; les artistes sont poussés à y exposer par l‘appât du gain, par le désir de se faire remarquer à tout prix, par la prétendue bonne fortune d‘un sujet excentrique propre à produire de l‘effet et à amener une vente avantageuse. Aussi le Salon n‘est-il plus, à la lettre, qu‘un magasin de tableaux à vendre, un bazar où le nombre énorme des objets assomme et où l‘industrie règne à la place de l‘art. See Ingres on the Salons. The increasingly conservative and academic juries were not receptive to the Impressionist painters, whose works were usually rejected, or poorly placed if accepted. In 1863 the Salon jury turned away an unusually high number of the submitted paintings. An uproar resulted, particularly from regular exhibitors who had been rejected. In order to prove that the Salons were democratic, Napoleon III instituted the Salon des Refusés, containing all the works that the Salon had rejected that year. It opened on May 17, 1863, marking the birth of the avant-garde. The Impressionists held their own independent exhibitions in 1874, 1876, 1877, 1879, 1880, 1881, 1882 and 1886. 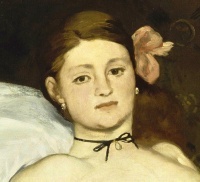 Edouard Manet never exhibited in the Impressionist exhibitions, but continued to exhibit in the official Salon. In 1881 the government withdrew official sponsorship from the annual Salon, and a group of artists organised the Société des Artistes Français to take responsibility for the show. In December 1890 the leader of the Société des Artistes Français, William-Adolphe Bouguereau propagated the idea that Salon should be exhibition of young, yet not awarded, artists. Ernest Meissonier, Puvis de Chavannes, Auguste Rodin and others rejected this proposal and made a secession. They created Société Nationale des Beaux-Arts and its own exhibition, soon (since 1899) named the Salon as well, officially Salon de la Société Nationale des Beaux–Arts, in short Salon du Champs de Mars. In 1903, in response to what many artists at the time felt was a bureaucratic and conservative organization, a group of painters and sculptors led by Pierre-Auguste Renoir and Auguste Rodin, organized the Salon d'Automne. Unless indicated otherwise, the text in this article is either based on Wikipedia article "Salon (Paris)" or another language Wikipedia page thereof used under the terms of the GNU Free Documentation License; or on original research by Jahsonic and friends. See Art and Popular Culture's copyright notice. This page was last modified 10:02, 1 May 2014. This page has been accessed 11,667 times.